1). 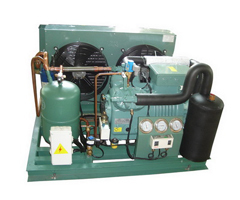 Bitzer two-stage semi-hermetic single compressor, with good quality, and high reliability. 2). The imported famous brand accessories, and complete configuration, to ensure the reliability of the performance. 3) The units is equipped with the charge air cooler, which can increase the capacity and EER. 4) It has the lower evaporating temperature, which can get to the lowest one as -50℃ with R22, and -65℃ with R404A, suitable for the device as the low temperature box and quick freezer equipment etc. 5) Specification is as the PDF file.